Most of the Indian families have 3-5 members and they need a washing machine of around 6 to 8 Kg capacity. Here we have compiled a list of 10 best semi automatic washing machines in India 2019. All these washing machines are of semi-automatic top load type and are priced between Rs. 6000 and 15000 in India. The criteria to compile this list was to make sure that the machine is well built, provides good wash quality, has powerful motor and after sales service is decent because these semi-automatic machines do face problem after a year or so, which makes after sales service very important. The design of these machines is very similar. The washer is on the left and the dryer is on the right with control knobs on the top to select wash programs, wash and dry time and drain water. Some machines have translucent lids so that you can see through them while the wash is going on. In this list, we have covered semi-automatic washing machines. If you are looking for a fully automatic washing machine then take a look at our list of best fully automatic top load washing machines under 15000. We have covered most of the major brands like LG, Samsung, Onida, Whirlpool, Godrej who are known for building quality products and service. You can find the specifications, pros cons of all these washing machines below. Links to Flipkart and Amazon have been provided with prices. Prices are updated regularly so that you can compare the prices and get the best deal available. Let's take a look at our list of best semi automatic washing machines in India. Onida offers great brand value in appliances and this semi-automatic washing machine does the same. This is a 7.2 Kg machine suitable for a family of 3 to 4 members varying upon the number of clothes you wash and on frequency on your washing. The build quality and was quality is decent. On the top of the machine, you get a wash timer, spin timer and wash selection as in other semi-automatic washing machines. The spin tub comes with Turbo Dry feature that perfectly dries the clothes and also has a regular buzzer to intimate the users around the ending of the current dry cycle. The spin motor has 1350 rpm and the results of cleaning and drying cloth are impressive for the pricing. 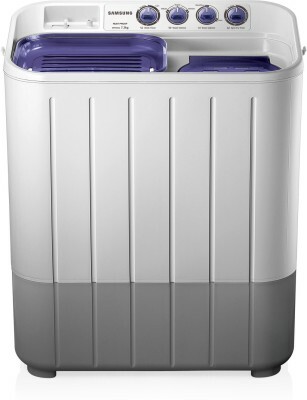 Overall for a budget of under 8000, this is a good pick for a semi-automatic washing machine with a 7.2 Kg capacity. This is one of the most affordable semi-automatic top load washing machines from MqrQ which is Flipkart's own electronics brand. Priced under Rs. 7000, it offers good value for money. As it is a semi-automatic top load washing machine, there are separate compartments for washing and drying. The control knobs and water inlet are on the top. The top lid is translucent so that you can have a look inside anytime. It comes with a 300 W motor which runs at an RPM of 1350. Both Motor power and RPM are good and will give a good wash to your clothes. There are 2 wash programs available: Gentle and Strong. Strong wash is great if your clothes have tough stains or you have a bigger load of clothes. The dryer on the right does a decent job and clothes might need to be hung for a couple of hours to completely dry. The semi-automatic washing machine comes with 2 years on-site warranty on the complete machine. MarQ has a decent after sales service in most of the metro areas. In tier 2 and 3 cities, you might face problems so go for bigger brands like LG, Samsung if you are from Tier 2 or 3 cities because big brands like LG offer good after-sales service there. Godrej is an old brand and they have been making some quality products for decades. This 7 Kg washing machine performs well overall and is good for a family of 4. The machine body is made of polypropylene which makes it rust-free and easy to clean. The wash and spin lids on the top sport transparent toughened glass. There is a beautiful floral pattern on the lids which adds to the style quotient. The washing machine works on Tri-Rotor Scrub Pulsator technology. The 3 rotor wheels mounted on the pulsator remove stains completely, giving you nice and clean washes every single time. As you must have seen on other washing machines, this one also comes with 3 wash programs. There is a daily wash, a Delicate Program for silk & satin fabrics and a Heavy Wash for extremely dirty clothes. The motor power is good but RPM is on the lower side but it won't make a major difference in wash quality. Still, if it bothers you, take a look at other options from LG in this range. Mitashi is not a well-known brand in the washing machine domain but this washing machine is a clear indicator that they build really good products. This Mitashi semi-automatic washing machine comes with a Boomerage Pulsator that is responsible to rotate the water and clothes to clean them properly and has a superior performance. It comes with 2 modes Easy Wash and Power Wash. Easy wash mode can be selected in case the clothes are not that dirty while power wash is used when the clothes are dirty and need a better cleaning with powerful rotation. There is a drying tub which rotates at 1300 rpm. The higher this speed, the faster is the drying time and 1300 is a good number to quickly soak the clothes. It comes with some other features, like a buzzer that indicates the current washing cycle has completed. Also, there is a short circuit unit that prevents harm to the motor in case of overload and switches off the machine. In terms of design, it has a solid rust proof body which allows you to keep it even in the bathroom. It can be easily moved from one place to other. Overall a good option for the pricing of under 8000. This machine comes with a 5-year warranty on the complete product as well as the motor which is excellent because most companies offer just 2-year comprehensive warranty. 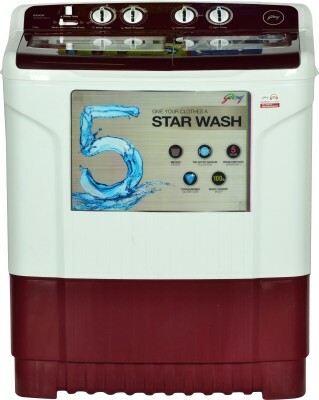 Intex WMS65ST is the cheapest semi-automatic washing machine in 6.5 Kg category. The washing machines come with a nice design and decent build quality. The machine is made of plastic which is usually the case with machines in this range. The washing area is on the left and drying area on the right with control knobs on the top of the machine. Water inlet point is also provided on the top so that you can connect a pipe there. It has a 350 W motor which has decent power. The RPM is 1320 which is really good. There are 2 programs available: Heavy and Regular Wash. If your clothes are dirty then going for the heavy wash would make sense. The washing machine does clean clothes well, thanks to pulsator method of cleaning and the high RPM motor. The dryer dries the clothes to a level that they just need an hour or two in the open to completely dry. Intex offers 2 years on-site warranty on complete machine and 5-year warranty on the motor, so if in case anything goes wrong, Intex service guys will take care of it. For the price, it offers good value for money. So this was our list of top 10 best semi-automatic washing machines in India. We hope that the list was helpful for our users. Let's take a look at our favorite washing machine now.